When I was growing up, we had a Christmas Eve tradition of hamburgers for supper. I loved ’em because hamburgers were my favorite thing to eat. Mom didn’t make them terribly often, so to have them on Christmas Eve before presents were opened was special. My dad’s parents were there, my brother, and sometimes Mom’s Mother, Grammy, joined us. It’s a tradition about Christmas that I loved. Later, after our church started having a Christmas Eve service, we went after opening our presents. It was always the same service. “Happy Birthday, Jesus!” It was a candlelight service that began at 11:00 p.m. But I need to back up. After hamburgers, we’d all go into the living room. We’d sing Christmas Carols, often I’d play piano and lead the singing. Then, we’d read the Christmas story from Matthew and Luke. THEN, we’d open presents. We always left the envelopes, if there were any on the tree branches, for last. Because the envelope always represented something too big to put under the tree. After all the presents were opened, we had snacks. Cookies, fruit breads, soft drinks for us kids, coffee for the adults, and peppernuts. I’ll explain peppernuts in tomorrow’s post. 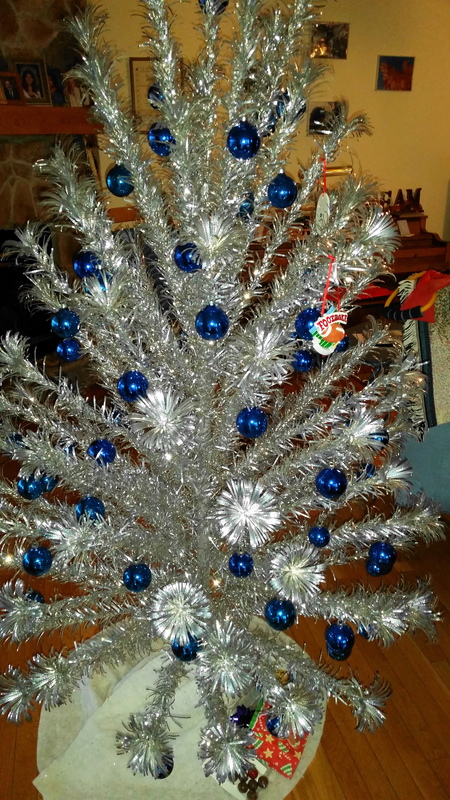 What I’ve pictured is my father-in-law’s genuine silver Christmas tree from the 50s/60s. See how the flash highlights the trumpets at the end of the branches. I love that. This is the third year for this tree. Unfortunately, both the color wheels have either busted or melted, so we just put it up a few extra ornaments people give for this year’s Christmas. As I think about Christmas traditions, I think about the last two Christmases, where we started new traditions. In 2012, my father-in-law was in a home, and we got his tree. I made a pot of chili for my husband and I, and we shared dessert with the Dad at the home he was in. He wouldn’t be with us much longer, leaving the earth that next March. Last year, we had friends over to share our pot of chili, and we will again tomorrow as well. Chili is becoming my new Christmas tradition. It’s easy, it’s fun, and different. When starting new traditions, take into account what will make the new tradition unique. I can never bring back the past, but I can make new memories. This year, I feel so blessed to have made the semi-finals of Operation First Novel that I can’t be gloomy because we’re not with “family.” My brother lives in California. My brother-in-law in Delaware, but they both have family they are always with. That’s OK. I bless them. What are your Christmas Eve traditions – old and new? Leave a comment and let me know. Previous postAre you ready for Christmas? I didn’t know you played the piano!